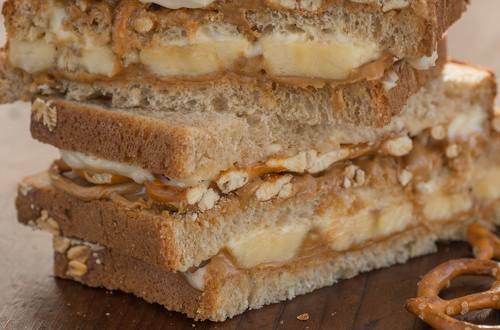 1 Spread one side of 1 bread slice with 1 tablespoon peanut butter; top with bananas. 2 Spread another bread slice with 1 tablespoon Hellmann's® or Best Foods® Real Mayonnaise and place Mayonnaise side down on top of bananas. Spread top of bread with remaining 1 tablespoon peanut butter, then top with pretzels. 3 Spread remaining slice bread with remaining Mayonnaise and place on top.